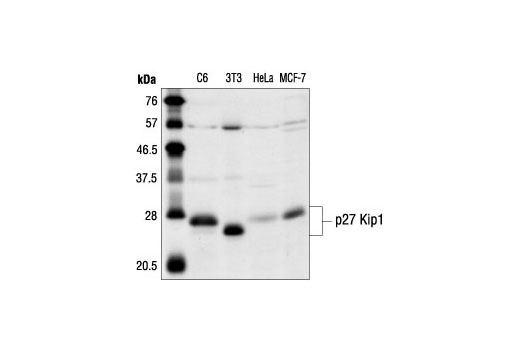 Western blot analysis of extracts from C6, NIH/3T3, HeLa and MCF-7 cells, using p27 Kip1 Antibody. Polyclonal antibodies are produced by immunizing animals with a synthetic peptide corresponding to the sequence of mouse p27. Antibodies are purified by protein A and peptide affinity chromatography. p27 Kip1 is a member of the Cip/Kip family of cyclin-dependent kinase inhibitors. Like its relatives, p57 Kip2 and p21 Waf1/Cip1, the ability to enforce the G1 restriction point is derived from its inhibitory binding to CDK2/cyclin E and other CDK/cyclin complexes. Expression levels of p27 are upregulated in quiescent cells and in cells treated with cAMP or other negative cell cycle regulators. Downregulation of p27 can be induced by treatment with interleukin-2 or other mitogens; this involves phosphorylation of p27 and its degradation by the ubiquitin-proteasome pathway (1-4). Lloyd, R.V. et al. (1999) Am J Pathol 154, 313-23. Polyak, K. et al. (1994) Genes Dev 8, 9-22. Kato, J.Y. et al. (1994) Cell 79, 487-96. Vlach, J. et al. (1997) EMBO J 16, 5334-44.